Green Computing is the study and practice of using computing resources efficiently. The global use of computing resources, both servers and desktops, continues to grow dramatically. There are opportunities to reduce the ecological footprint of computing through careful selection of hardware and improved computer network designs. Buy and use a low power desktop or a laptop computer (40-90 watts) rather a higher power desktop (e.g. 300 watts). Find out the normal operating power (watts) required. The maximum power supply (up to 1kW in some modern gaming PCs) is not as important as the normal operating power, but note that power supply efficiency generally peaks at about 50-75% load. Idle state represents 69 to 97% of total annual energy use, even if power management is enabled. Computer power supplies are generally about 70–75% efficient;to produce 75 W of DC output they require 100 W of AC input and dissipate the remaining 25 W in heat. Higher-quality power supplies can be over 80% efficient; higher energy efficiency uses less power directly, and requires less power to cool as well. As of 2007, 93% efficient power supplies are available. Use a small mobile device such as and Android phone in place of a desktop or laptop. For desktops, buy a low power central processing unit (CPU). This reduces both power consumption and cooling requirements. Turn your computer and monitor off at the power point when you are not using it - even when notionally off a computer can draw considerable power. This off power can exceed the power used when on if the computer is used intermittently. Replace your CRT screen with an LCD screen. Keep your PC or laptop for at least 5 years. If you're leasing, shift to a 5 year period. This reduces resource and energy consumption associated with the manufacture and distribution of PCs by 40%, compared to replacing PCs every 3 years which is current corporate practice. Avoid an unnecessary operating system version upgrade which requires a hardware upgrade. Use Linux (such as Ubuntu), which requires less resources than many other operating systems on an older computer as a spare or a file server. As of version 2.6.21, the Linux kernel went tickless, and no longer has a fixed 1000Hz timer tick. The result (in theory) is huge power savings because the CPU stays in low power mode for longer periods during system idle. Use power management software to find programs that are misbehaving while your computer is idle. Cheap PC cases often have low quality power supplies that are inefficient at converting incoming electricity for use within the system. Computer games consoles are not optimised to reduce power consumption. Games consoles - of which 62 million of various brands were sold in 2007 - use large amounts of electricity for high power graphics and sounds. Don't leave your computer turned on when it is not being used. Shut it down or hibernate it. Note that some systems still use power when on standby. Use server virtualisation to aggregate multiple under-utilised servers onto more energy efficient server infrastructure. Use blade servers instead of rack or standalone servers to reduce power consumption. Specify low energy consumption level in Request for Tender documents. Shift to 5 year desktop and laptop leases. Measure your data centre power usage. Use server and/or web-based applications where possible to extend desktop service life and reduce desktop software maintenance. Establish policies governing the acquisition, usage and disposal of computer hardware to minimise energy consumption and environmental impact. A laptop computer used 5 hours each day generates around 40 kilograms of greenhouse gas each year. Desktop computers used the same way can generate between 200 and 500 kilograms. More than half of this is from using the monitor. An LCD panel monitor generates around half as much greenhouse gas as a conventional CRT (Cathode Ray Tube) monitor. Adjusting its brightness lower can cut emissions to a quarter. Switch computers and equipment off when they’re not in use. This cuts greenhouse gases, extends product life and avoids a potential fire hazard. Fit-PC is the size of a paperback and absolutely silent, yet fit enough to run Windows XP or Linux. fit-PC is designed to fit where a standard PC is too bulky, noisy and power hungry. If you ever wished for a PC to be compact, quiet and green – then fit-PC is the perfect fit for you. Fit-PC draws only 5 Watts, consuming in a day less power than a traditional PC consumes in 1 hour. You can leave fit-PC to work 24/7 without making a dent in your electric bill. "The Zonbu is a new, very energy efficient PC. The Zonbu consumes just one third of the power of a typical light bulb. The device runs the Linux operating system using a 1.2 gigahertz processor and 512 meg of RAM. It also contains no moving parts, and does even contain a fan. You can get one for as little as US$99, but it does require you to sign up for a two-year subscription." Sun Microsystems is reporting increased customer interest in its Sun Ray, a thin desktop client, as electricity prices climb, according to Subodh Bapat, vice president and chief engineer in the Eco Responsibility office at Sun. Thin clients like the Sun Ray consume far less electricity than conventional desktops, he said. A Sun Ray on a desktop consumes 4 to 8 watts of power, because most of the heavy computation is performed by a server. Sun says Sunrays are particularly well suited for cost-sensitive environments such as call centers, education, healthcare, service providers, and finance. PCs have more powerful processors as well as hard drives, something thin clients don't have. Thus, traditional PCs invariably consume a substantially larger amount of power. In the United States, desktops need to consume 50 watts or less in idle mode to qualify for new stringent Energy Star certification. The "ultra-portable" class of personal computers is characterised by a small size, fairly low power CPU, compact screen, low cost and innovations such as using flash memory for storage rather than hard drives with spinning platters. These factors combine to enable them to run more efficiently and use less power than a standard form factor laptop. 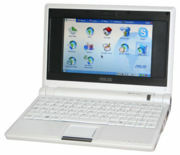 The Asus Eee PC is one example of an ultraportable. It is the size of a paperback, weighs less than a kilogram, has built-in wi-fi and uses flash memory instead of a hard drive. It runs Linux too. The Green Grid -- a consortium of information technology companies and professionals seeking to improve energy efficiency in data centers around the globe. This page was last modified 01:24, 13 June 2015. This page has been accessed 175,265 times.